« Retro Mod Triumph Bonneville T120. Back To Basics. Published by Cyril Huze December 13th, 2016	in Editorial and Events. 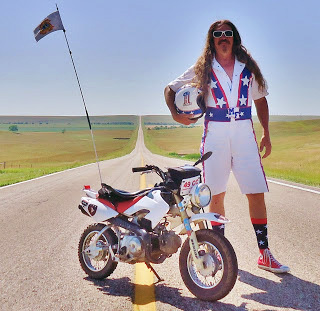 Going after a 50cc mini bike long distance world record? Why not. Kevin Bean’re intends to ride coast to coast from Daytona to San Diego to add his name to the Guinness World Records. Kevin will ride with friend Tim Ford (not on the same bike!) for what is expected to be a 9-day 3000-mile trip, of course using mainly back roads. This world record attempt is also the pretext to raise money for charity, the Aidan Jack Seeger Foundation, whose purpose is to advocate for ALD newborn screening in every state. ALD is a deadly genetic disease that affects 1 in 18 000 people. It most severely affects young boys and men with loss of muscle control and progressive dementia leading to death. If any one can do it, Bean’re Can !! Good cause Bean’re, God speed. Can’t wait to see all the great pictures along the way. Kevin is a great guy with tremendous heart and character!!! Good luck and stay safe!! Go get em Bean’re you da man !!! We’re with you all the way Bean’re! Good luck, and have fun. I hope you generate lots of money for the charity. Really proud of you! This gonna be Epic ,Kevin and Timmy ride again ! Awesome sausage!! You’re the best, Beans!! If only he could get Jim Carry and Jeff Daniels to join him with these guys riding two up. keep the light shinning !